The US president has "no hard feelings" about the Iraqi journalist who flung shoes at him, the White House says. Muntadar al-Zaidi threw his shoes at George W Bush during a Baghdad press conference, calling him a dog. 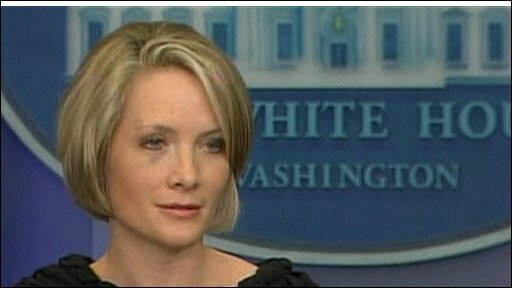 Mr Bush was unhurt in the incident, but his spokeswoman, Dana Perino, received a black eye in the melee that ensued. Mr Zaidi on Tuesday appeared before an investigating judge and "admitted the action he carried out", a High Judicial Council spokesman said. Iraq's military earlier denied claims by Mr Zaidi's brother that the journalist had been beaten in custody. The TV journalist allegedly suffered a broken arm, broken ribs and internal bleeding after the incident, his older brother, Dargham, told the BBC. Mr Zaidi has been remanded in custody while the judge investigates the case as part of complicated legal proceedings that could take months before a possible trial. Ms Perino said Mr Bush trusted Iraq's legal system to decide an appropriate punishment for the assault. "The president harbours no hard feelings about the incident," she said. The spokeswoman was injured when a heavy metal microphone stand swung round at her as security guards rushed to restrain Mr Zaidi, reports said. Arrested by forces under the command of Mowaffaq al-Rubaie, Iraq's national security adviser, Iraqi authorities have said Mr Zaidi, 28, will be prosecuted under the country's law. "Zaidi was brought today before the investigating judge in the presence of a defence lawyer and a prosecutor," said Abdul Satar Birqadr, a spokesman for Iraq's High Judicial Council spokesman. If he is charged with trying to murder a president, his sentence could be seven to 15 years in prison, said Mr Birqadr. Tuesday saw a second day of rallies being held across Iraq hailing Mr Zaidi as a hero and calling for his release. Meanwhile, offers to buy the shoes he threw were reportedly being made around the Arab world for as much as $10m (£6.5m). The head of Iraq's journalists' union has asked the government for clemency towards the journalist. Mouyyad al-Lami described Mr Zaidi's action as "strange and unprofessional" but urged Iraqi Prime Minister Nouri al-Maliki, who was standing beside Mr Bush during the assault, to show compassion. The previously little-known journalist from the private Cairo-based al-Baghdadia flung both his shoes at Mr Bush on Sunday during the US president's farewell visit to Iraq before he steps down next month. "This is a goodbye kiss from the Iraqi people, dog," yelled Mr Zaidi as he threw the shoes. Dargham Zaidi told the BBC his brother had deliberately bought Iraqi-made shoes, which were dark brown with laces, from a well-known shopping street in central Baghdad. 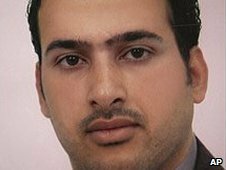 A graduate of communications from Baghdad University, Mr Zaidi lives in the Iraqi capital where he has worked for al-Baghdadia for three years.